PRODUCT DESCRIPTION: Time released granule which will last for 1 – 2 months when applied to turf around the home. All natural and pleasant smelling, the granules will blend into the turf on which they are applied and gradually release their scent down into the soil through where making it uncomfortable tunnel. The odor is offensive to moles so they tend to stay out of treated soil. 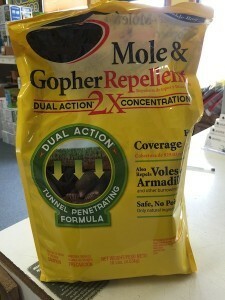 WHERE TO USE IT: Anywhere moles, voles, gophers or armadillo are active. In general, these will keep them off treated lawns but if you have a grub problem, then the need for food may force them to keep digging. If you still find digging 1 week within treating, do grub control as explained in our GRUB CONTROL article. TARGET ANIMALS: Moles, voles, armadillo and gophers. RATE OF APPLICATION: Use one pound (1 lb) per 500 sq/ft of area; apply once a month throughout the year when animals are active. 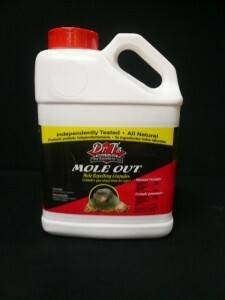 We also have the old Dr T's Mole Out available in 25 lb pails too. Works on the same group of animals; coverage is half as good (1 lb per 500 sq/ft).